As part of an existing project for Europartnerships, I needed a passing knowledge on some of the pelagic fish species in the North Atlantic, otherwise known as FAO 27 fishing area. Mackerel (Scombus scombus) I had heard of and of course eaten (tastes great with a sweet gooseberry butter sauce). Horse mackerel (Trachurus trachurus) was however new to me. also known as scad, it can grow to 60cm and is eaten in the mediterranean countries and Japan. Tuna turned out to describe a multitude of species, such as albacore or bonito or the bluefin. Their red flesh is due to the increased amounts of myoglobin, the oxygen capturing molecules in muscle. Apparently tinned tuna tends to be skipjack tuna from tropical waters and has the added benefit of less mercury accumulation that the other larger species. Sardines also covers a range of species (up to 21 according to Wikipedia!) and the sardines in supermarket tins are often not sardines but young herring or sprat, close relatives. 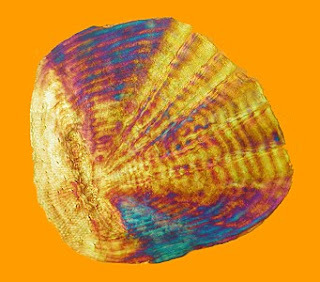 The attached picture is of a Dorade fish scale, a mediterranean species, taken using polarised light and filters.